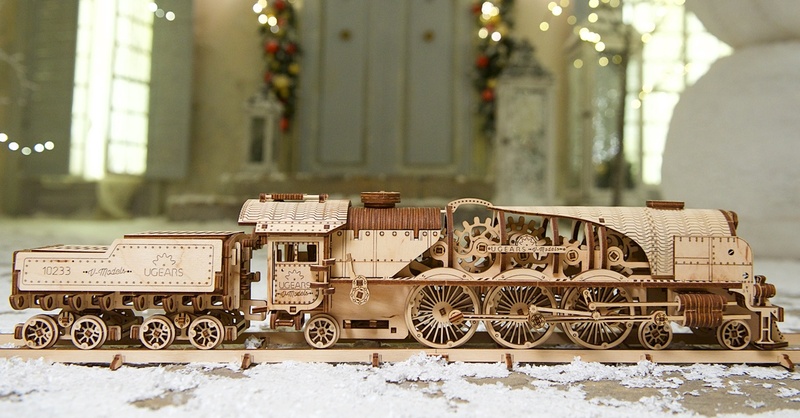 Ugears mechanical models: put together without glue and watch it move on its own! At this magic time of year, we all are children and we believe in miracles. 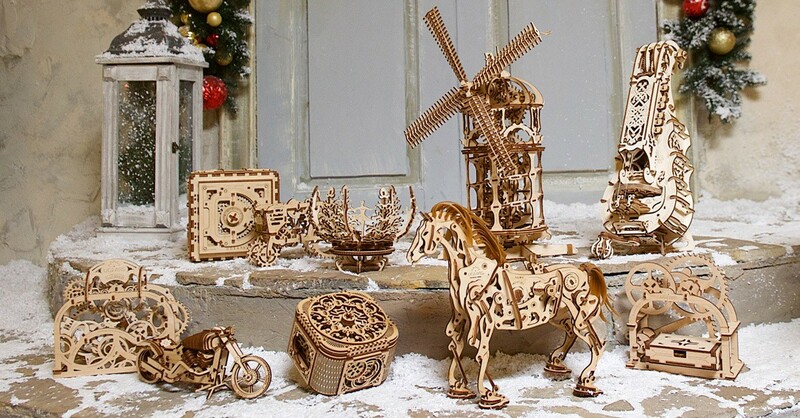 The magic that moves the Ugears mechanical 3D puzzles – and the hearts of people around the world – is here with you now to make this winter holiday even more special. Everyone will find the model for him/herself to assemble or to become a wonderful gift to friends and family, for every model is a piece of clever mechanics and beautiful design. 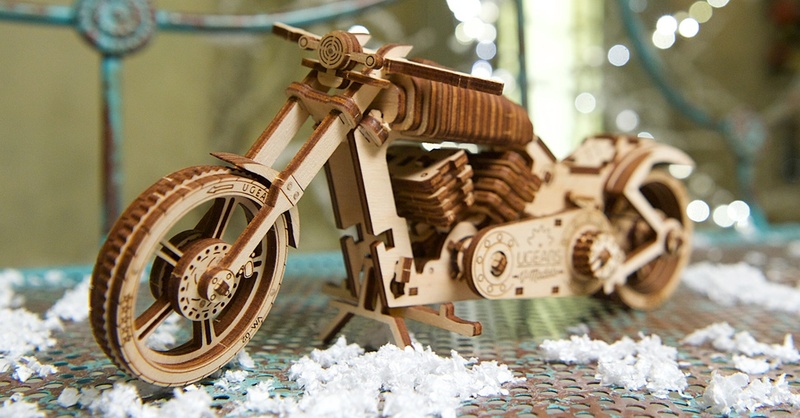 The model kit contains all you need for assembly: plywood boards with laser-cut details, rubber bands and a detailed instruction – no extra tools are required to put it together. Now, we’d like to tell you about a few of our favourite models and share Ugears magic and pass it over to all our friends. Come join the winter miracle with us! 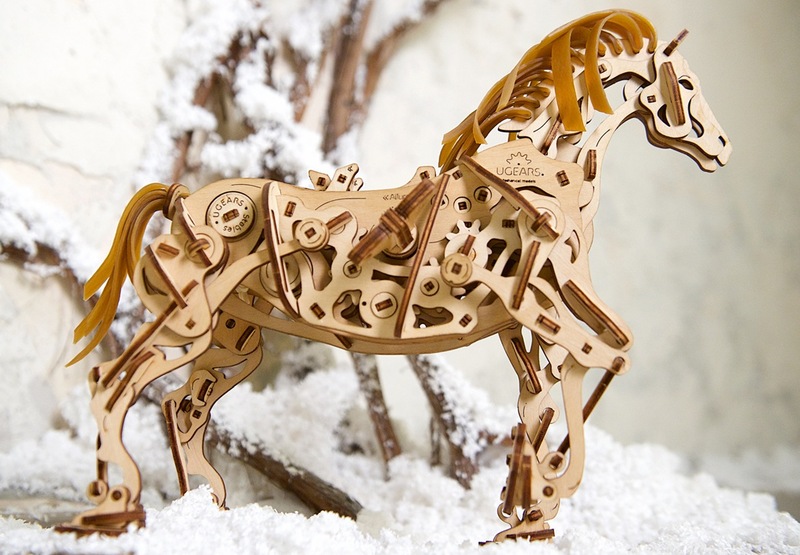 The Horse Mechanoid is a walking mech that has the power to amaze and fascinate a person of any age, gender, or area of interest. Although, just like with a real animal, Ugears’ Horse takes patience and attention to tame. This means, the assembly requires concentration and meticulous following of the instructions. While putting it together, you will be observing how bits and pieces are little by little turning into a complete model. The counter-weight, or pendulum, you will install into the model’s chest is there to animate its legs. You will see it is shaped like a heart to make your horse look even more alive. This is a safe in which Santa Claus keeps all the presents for the good kids. And he is the only one with the code to open it. You can play Santa and have your own safe with a 3-digit code you set in the process of assembly. Putting this model together will make you feel like a pioneer of mechanics and a little bit like a magician. 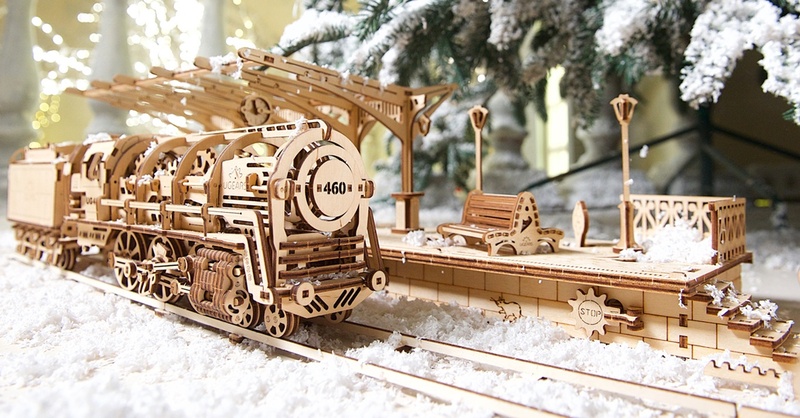 Because not only you will get to build your own locomotive, but as the train goes puffing down the track you will feel the clock going backwards taking you back to your childhood. 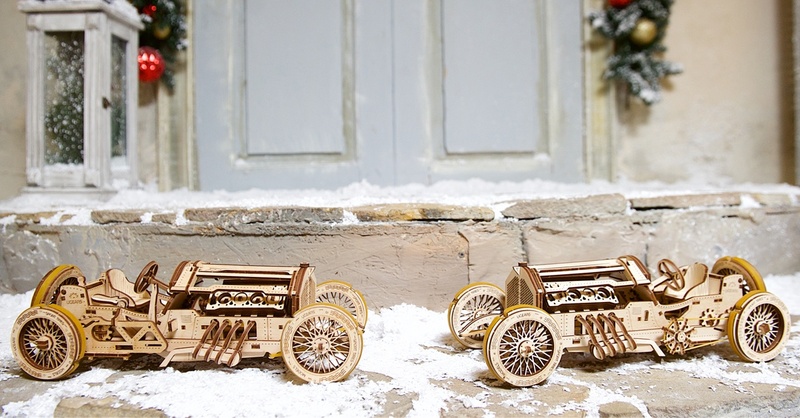 The fascinating appearance, meticulously detailed design and clever mechanics – are the backbone of this model. Additionally, you can install a crossing to coordinate the traffic while your locomotive dashes through the snow towards the future holidays to only make a stop at the magically realistic platform like a real train. If you are tired of gloomy frosty days and dream of sunny holidays in the warm seas, Ugears has a perfect solution for you. Assemble the Trimaran Merihobus, learn the gears and rigging, find out how to steer a ship and sail away to the island of your dreams. Elegant and fast, the Sportscar U-9 Grand-Prix carries unforgettable hours of fun – the assembly will make you feel like an automobile engineer. Start the engine to become a real car racer, move from the stands to the very heart of the race – on the track. You can put your Sportscar U-9 Grand-Prix on the shelf, but rest assured it won’t stay there too long. You’ll want to feel the drive again and win another race! Within Ugears collections you will find a wide variety of models as well as different approaches to the mechanisms of the same type. The ever-popular train theme inspired us to continue looking into the Age of Steam and produce the Express Steam Locomotive with Tender that also includes 2.45 meters of rails. The minutely detailed futuristic design of the Express reveals the beauty of moving details: gears and a flywheel, the workings of the cylinder-piston arrangement – the main mechanical blocks of an actual steam train. 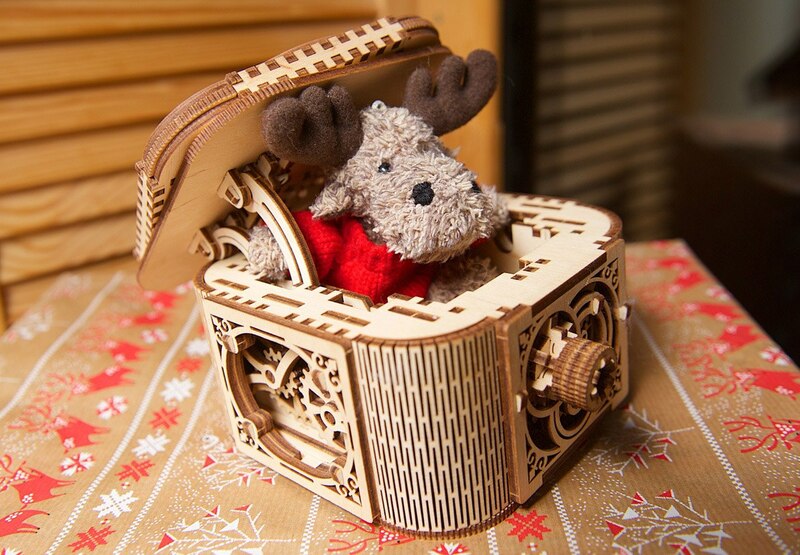 Come up with your own Christmas tale for your friends and family with Ugears’ Mechanical Theater. 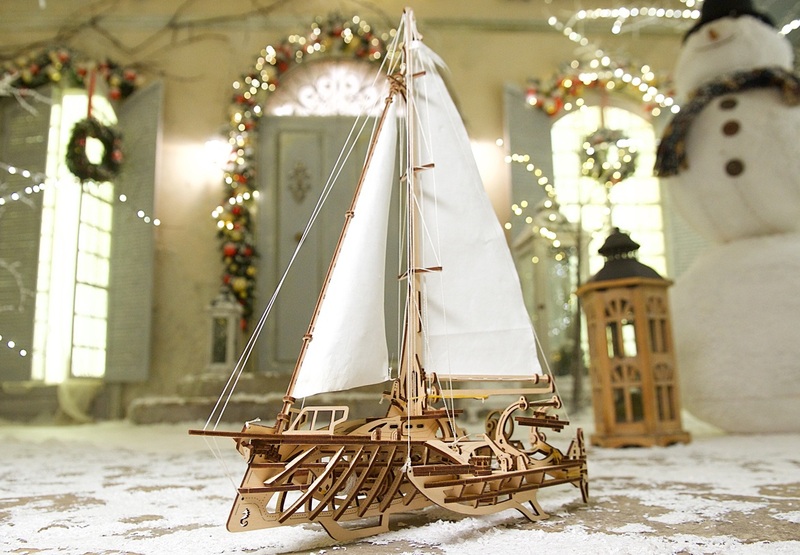 This model doesn’t take much time to assemble and while putting your stage together, you can think of a story about epic adventures of the characters that you have in the kit: Prince, King, Castle, Dragon, Witch, Jester, Princess, and a Treasure Chest. The Theatre inspires and provokes your imagination while giving you a cozy feeling of home and family. 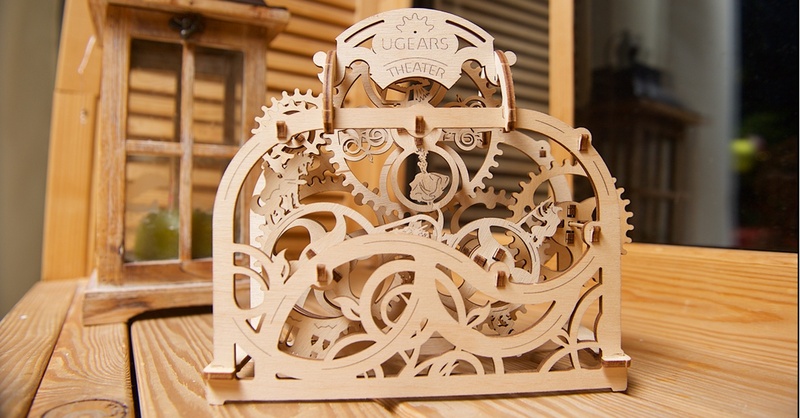 And who knows, maybe it will become your family tradition to show-and-tell a Christmas story to your little ones with your own Ugears Mechanical Theater. 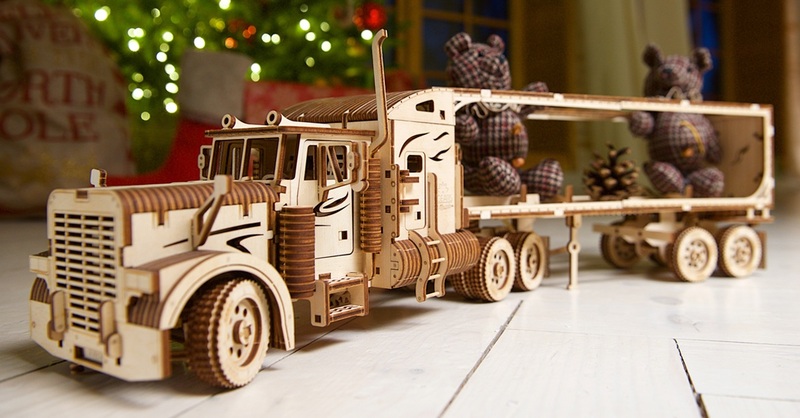 The Heavy Boy Truck VM-03 from Ugears will deliver a load of presents to any corner of your house. The mechanism of the Truck is designed to cover long distances and you will be surprised to see how far your new transport can run. Putting it together you will figure out the principle of its workings. We are sure you’ll love the detailed design and an opportunity to feel like a real long haul driver. 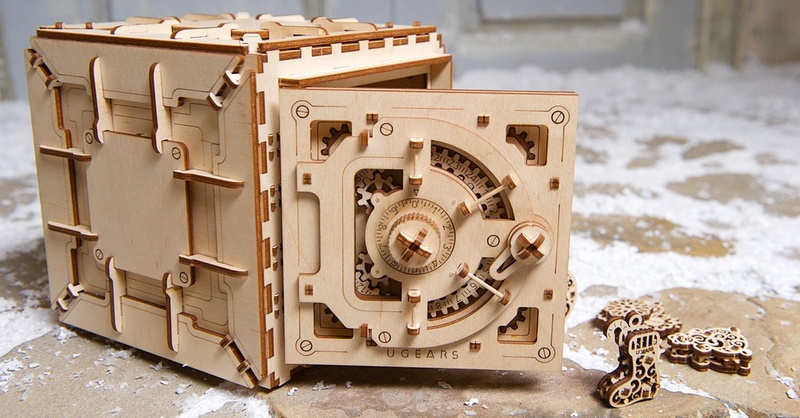 Keep your secrets safe with Ugears’ original Treasure Box that will only reveal its precious contents to the one who built it. Its exquisite design enthralls the eye while the delicate mechanism hides the riddle holding the key to the secrets within. This model will become a perfect decoration in any home and something sweet and intriguing to demonstrate to your friends and family.